Roxanne Dunbar Oritz, author of Indigenous Peoples' History of the United States, says that Native Americans need more than name restoration from the Obama Administration. SHARMINI PERIES, EXEC. PRODUCER, TRNN: This is the Real News Network. I’m Sharmini Peries coming to you from Baltimore. Last week President Obama officially changed the name of Alaskan Mount McKinley, North America’s tallest mountain peak, back to its original Native name, Denali. While in Alaska the president attended a round table discussion with Alaskan Native leaders and other government officials at the GLACIER conference on Monday. Here’s what he had to say. 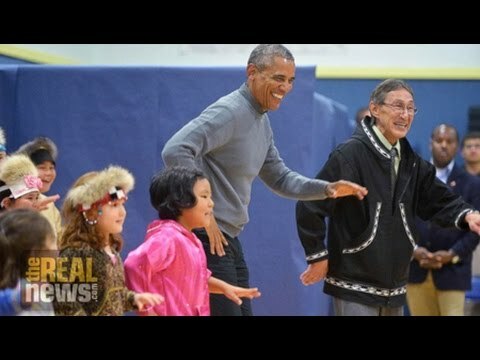 PRESIDENT BARACK OBAMA: Since I took office I’ve been committed to sustaining a government-to-government relationship between the United States and our tribal nations. And hopefully we will have set a new pattern and a new set of relationships that will extend well beyond my own presidency. Because when it comes to the first Americans, how we interact with these communities says a lot about who we are as a country. And I think the people of Alaska understand that as well as anybody. PERIES: With us to discuss President Obama’s Alaskan trip and his track record on Native issues is Roxanne Dunbar-Ortiz. She’s the author and editor of seven books, including her most recent, An Indigenous Peoples’ History of the United States. She joins us today from San Francisco. Roxanne, thank you so much for joining us today. ROXANNE DUNBAR-ORTIZ: Thank you, Sharmini. PERIES: Roxanne, what do you make of renaming the mountain Denali, and also the significance of it in terms of the Aboriginal Americans, First Nations? DUNBAR-ORTIZ: Well, the national park in which now Mt. Denali is located was already named Denali National Park. That came from an earlier movement to change the name. Also the mountain. So it’s, symbolically it’s always important when Native names are used, especially to designate the sacred lands. And not only Denali National Park, but every national park and territory claimed by the United States are sacred areas for Native people that were taken illegally outside of treaties or agreements. So actually all of them should be restored to the appropriate indigenous peoples, not just change of name. PERIES: Symbolically. What about what the president said in terms of his office dealing with Native people government-to-government? I think this is significant. DUNBAR-ORTIZ: Well, this has always been, or at least since the Indian Self-Determination Act during the Nixon administration, government-to-government relationships were established. They had been established by treaties and agreements, and also by the Indian Reorganization act. But that was all set back with the Termination Act of 1953 that sought to do away with the Native Americans’ land base and existence completely, and that was only reversed with the Indian Self-Determination Act. So the relationship has been called government-to-government, but there’s still a limited sovereignty based on the Supreme Court’s decisions in the 1820s based on invoking the Doctrine of Discovery that Native people have no inherent rights to their land or resources. That it’s a gift from the government. This is belied by all of the treaties and agreements and history itself. And now, international law that’s developing with the Declaration on the Rights of Indigenous Peoples in 2007 that the United Nations General Assembly passed. So we’re going to have to strengthen that government-to-government relationship so that it’s equal. That declaration requires prior and considered consent on the part of Native people to do any kind of activity that affects indigenous peoples. PERIES: I mean, it’s one thing to visit Alaska, that’s very good, to renaming mountains back to their original Native names are good moves. However many have said that there’s a big gap between what the president is saying and what he is doing, and I think is a particular reference in terms of the support he has for the fossil fuel industry, for example, sanctioning of Shell oil drilling in the Arctic. What do you make of that? DUNBAR-ORTIZ: Well, it’s a deep contradiction. It’s almost, it just seems strange that it hasn’t been brought up in the media, this contradiction, because indigenous nations all along the Northwest Coast and through Canada and up into Alaska have been resisting this. They, in Portland they had, they call it Shell No. And many kayaks and other boats went out to surround the installation that was harboring there, that was on its way to Alaska to do the drilling. So there’s been widespread protests. And it’s not the only thing that has happened during the Obama administration. Even though the Keystone pipeline has been held up, thankfully, it is not the only pipeline. Pipelines are going horizontally across the country, too, and through Northern Cheyenne territory all across Montana and into the Lummi nation in Northwest Washington State. So not just environmental activists, Native and non-Native, but tribal governments are officially opposed to this, and this is, Obama has set the stage for the next administration to continue these practices without prior and informed consent on the part of indigenous peoples. PERIES: Roxanne, give us a sense of the nature and the amount of resistance that the Native communities are mounting against drilling in the Arctic. DUNBAR-ORTIZ: Well yes, and drilling anywhere. There are blockades throughout Canada, especially Western Canada, against drilling. Of course, fracking, tar sands. And these are, all of them have cross-border implications. Whether it’s with Alaska or with the lower 48, and Hawaii has this similar problem as well. Puerto Rico is under the same circumstances, and with [dependency] of Guam and Marshall Islands. All of these territories that are claimed by the United States would do much better if they could, if they had their full sovereignty and could actually act on behalf of their people in opposing this. Specially in sacred sites. PERIES: And the First Nations leaders have taken a position that they will resist further drilling in the North? DUNBAR-ORTIZ: Yes, absolutely. I think there’s a consensus. That doesn’t mean that you won’t find, especially in Alaska where the Alaskan Native Land Claims Act of the 1970s, also under Richard Nixon, rather than establishing tribal governments as had been done with the Indian Self-Determination Act, and prior to that the Roosevelt administration, the Indian Reorganization Act, they treated it as–of course Alaska became a state in 1948. They treated it as a collection of corporations. So Native people have shareholding interests in these resource extractions. They had very little organized power in the 1970s to oppose this arrangement. It’s very hard to undo, and it is the, it is really the map, the kind of grid that the United States and of course corporations would like to apply to all Native nations in the lower 48, as well. PERIES: Roxanne Dunbar-Ortiz, she’s the author and editor of many books, and the most recent one An Indigenous Peoples’ History of the United States. Thank you so much for joining us today.